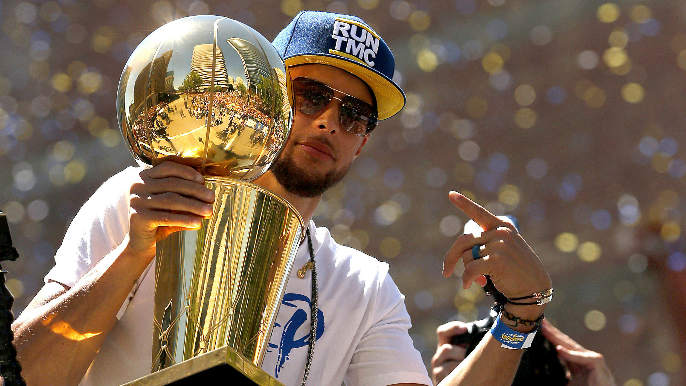 Stephen Curry showed respect to a bygone era of Warriors basketball during the parade on Tuesday, rocking a “Run TMC” hat, a nod to the early 90s Golden State squad featuring Hall of Famers Chris Mullin, Tim Hardaway, and Mitch Richmond. “Dude that was awesome,” Mullin said. “Someone just texted me that a little bit ago and I was like ‘I’ve got to thank Steph man.’ I actually shot it out to Mitch and Tim and they got right back like ‘Oh man that’s awesome, Steph giving us a little respect.’ So thanks to Steph and maybe I’ll see him at Round Hill (Country Club) in a few weeks. The trio, coached by Don Nelson, only played together from 1989-1991, but had a profound impact on the Bay Area sports scene at that time. Mullin explained why. Mullin closed by praising this Warriors group, and head coach Steve Kerr in particular. Listen to the full interview below. To hear Mullin on Steph, start from the beginning.